If the Catholic Church kept statistics on its missionaries with the same feverish devotion that the National Football League maintains metrics on its premier quarterbacks, the accomplishments of Franciscan Friar Junípero Serra — famed as the founder of California’s Mission system — would rival those of Peyton Manning, Joe Montana, John Elway, and Johnny Unitas combined. A religious mystic with one foot planted in the 18th century and the other in the 17th, Serra’s spiritual yearnings proved too powerful to find satisfaction as the theologian and scholar that he was for most of his life. At age 38, Serra shipped out to Mexico from Spain, where he was born and grew up, and spent 18 years reaffirming the faith of recently converted Indians there. At age 56, he was dispatched to California to take over the work of the Jesuits, who’d recently been deep-sixed by the King of Spain for their intellectual independence and uppity insolence. During his time in California, Serra would found no fewer than nine missions — the first nine of 21 that would eventually sprout up — though Santa Barbara’s would not be among them. (He would be on-hand, however, to dedicate Santa Barbara’s now-historic Presidio.) In that time, Serra would travel more than 14,000 miles while in California, by foot, boat, horse, or mule. At the time, there were no roads, no water, no system of transportation. And he traveled at least 1,000 miles by foot, all the while suffering from an oozing, ulcerated sore on one of his legs, caused by a spider bite many years prior that never healed. While a similar arachnid attack — albeit radioactive — would later transform Marvel Comic character “Puny” Peter Parker into the Amazing Spider-Man, Serra and his travels were pivotal to the transformation of wild and mysterious land into the State of California. It’s safe to say Serra didn’t merely put California on the map; he drew the very map from which California would spring. It’s also safe to say that the Mission system Serra put in place would eventually wipe out many of the native people then occupying that map. Numbers vary, but roughly 80,000 California Indians would be baptized by the early missions and about 60,000 would be buried, but only after having fallen prey to diseases imported from Europe by the new settlers. The nine missions Serra established spanned the distance between San Diego and Monterey; the road between would become El Camino Real, which would evolve into a major thoroughfare for millions of tourists, travelers, and settlers. For most of California’s history, Serra was lionized as a sanctified explorer and foist, as such, upon generations of unsuspecting 4th graders as an icon of destiny. 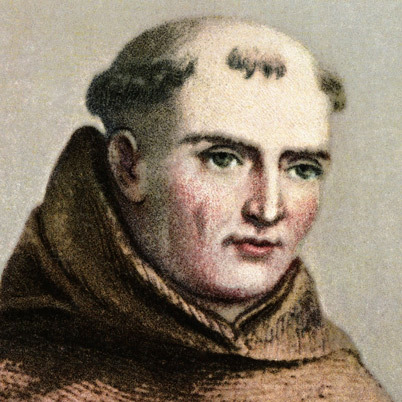 In this telling, Serra was worthy, amazing, and — in the brown sack cloth of Franciscan garb and peculiar tuft of forehead hair that sprouted like an island from his skull — even duller than George Washington could ever have hoped to be, with or without his famous wooden dentures, implanted slave teeth, or alleged pot plantation. In more recent years, however, Serra has emerged as a major villain in the revisionist histories of California, an agent of genocidal disease and the scourge of colonialism inflicted on the native populations, good intentions be damned. Given that we will be observing the 300th anniversary of Serra’s birth all year, it’s not surprising that two new biographies have just come out on Serra, and another one is on the way. This coming Monday, Gregory Orfalea — first cousin of Kinko’s founder Paul Orfalea — will be discussing his latest tome, Journey to the Sun: Junipero Serra’s Dream and the Founding of California, at the Santa Barbara Mission. Orfalea’s work, 12 years in the making, attempts to hew a middle ground between the polar extremes, painting the Franciscan as neither saint nor sinner, but an accomplished man of the spirit, gritty pioneer, and a gifted administrator. While Serra was undoubtedly an agent of Spanish colonialism — the cross followed the flag in hopes of reigning in Russian settlement then sprouting up along California’s coast — Orfalea insists Serra’s blade cut both ways. Orfalea’s ambition is to place Serra in the intellectual and spiritual context of his time, which is a lot further away than the mere number of years might indicate. By contemporary standards, Serra’s universe seems one of magical realism. By reputation, Serra was a gifted evangelical firebrand. He was inspired to do missionary work, in part, by a contemporary known as “the flying blue nun,” who was famous at the time for her ability to “translocate” from her home in Europe to the New World, where she would convert the heathen. Orfalea, a California transplant who lives on the East Coast now but teaches intermittently at Westmont College, said the documentary trail for Serra’s early days in Spain was all but nonexistent, but that his letters while traveling through California were quite voluminous. “For the last 15 years, we have 264 letters in four volumes,” he said. With this record having been thoroughly dissected by previous Serra scholars, Orfalea said he felt an urgency to uncover fresh documents. He found one hitherto unreported letter Serra had written while visiting a new museum located 30 miles in the bottom of a ravine in a small Mexican town near a mission where Serra worked. That letter provided a spicy appreciation of the sexual friskiness of a man and a woman about to be married and Serra’s doubts that they could stick to the straight and narrow of monogamy. Orfalea said he found another letter from Serra in the archives of Georgetown University, ironically a hotbed of Jesuit intellectualism, and this too involved a wedding at which he found himself happy to serve as witness. Serra died in 1784, still in the early days of the Mission period. The devastation wrought by European born diseases would not become manifest until much later. Not only did the Missions introduce new strains of germs to which the native populations were defenseless, but they brought the American Indians out of their villages into enclosed areas where more people would be exposed. Over time, the newborns died off disproportionately, and the populations failed to reproduce at the same rate. By the 1820s, it was obvious even to some church leaders that the exposure was deadly.